The matte finish makes the bag attractive. This is why we selected this bag and placed our order through there website. We handed these bags out to promote our company. Since then we have seen a big increase in calls and inquires about what we offer. Thank you Custom Earth Promos. Just placed our 4th order of this bag for our grocery store. Customers love them and we are making an impact saving the planet! Good handle size. Very high printing quality as well. Great craftsmanship, really shows off our company well. We will definitely be using this company again. Bag is easy to wash, good for food retail. We use this bag all the time. Great craftsmanship, really shows off our company well. We will definitely be using this custom earth promos again. We used this bag at our outdoor event. Was a big hit with clients. Just received our bags and they look great, can't wait to promote my new product with our cool reusable bags. We completely personalized our bag and it came out great, I would recommend this company. Best reusable, recycled grocery bags on the market. Don't waste your time with anyone else. Amazing! Attractive, spacious, and high quality! Really impressed with the quality of these bags! They look and feel amazing! The bags we ordered are turning heads! Our logo can't go unnoticed! These were great to have at our latest expo! Our clients loved them! We selected the red and the blue bag with our company logo on it. Printing quality was consistent on all of the bags. Stiching is strong as well. I would advise going with this model bag. Customer service is key with me when it comes to the company's I choose to do business with. I have now had a relationship for the past three years with custom earth promos, I always get the best care and oversight for all my orders and the product is always as requested. I would highly recommend this company. I work for a family owned grocery store in the south. We switched to recycled reusable bags to move towards a more eco-friendly approach to doing business. Customers love them, and love the fact that we are making a difference in the environment. We ordered these bags for our most recent trade show and they were a huge hit! The matte finish on these bags really creates a classy look and feel. Really pleased with the outcome. Great way to promote our company. I will be using this custom earth promos. There is so much room on this bag for our logo! Really attention grabbing. Great bags really like the side panels of these bags. Great customer service that offers a great product. I would'nt use anyone else but custom earth promos. Very sturdy and water proof. We ordered a lot and they came out great. Black bag is the one we went with. Looks great with our white logo on it. I work in the marketing/branding department of my company we used custom earth for there seed paper business cards which were a big success on the strength of that they are unique and say we care about the environment. We decided to use them for our upcoming trade show and ordered recycled reusable bags from them. We just received the bags they look great now we are prepping them with company info and company lanyards (which we also ordered from CEP). I would suggest using this company they offer a lot of different products and are eco friendly. Very affordable and good customer service. Love the stripes on the side, makes our printed logo stand out more. We ordered the green color, looks great with our company graphic. 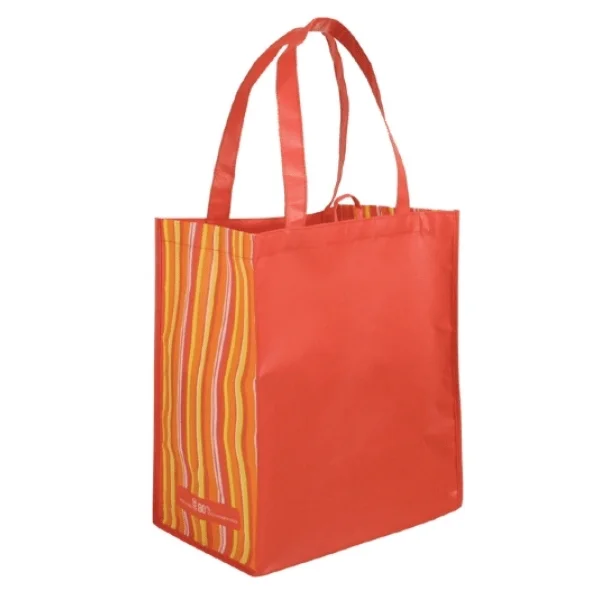 As durable as it is attractive, the Reusable Wholesale Tote Bag from Custom Earth Promos is made from recycled water bottles. It features reinforced 20-inch handles that are more than capable of bearing the weight of weekly groceries. And the bag is spacious enough so that whether your customer is hauling bulky items or more delicate products such as easily damaged fruits, he or she can rest assured that cargo under 20 lbs. should arrive safely. 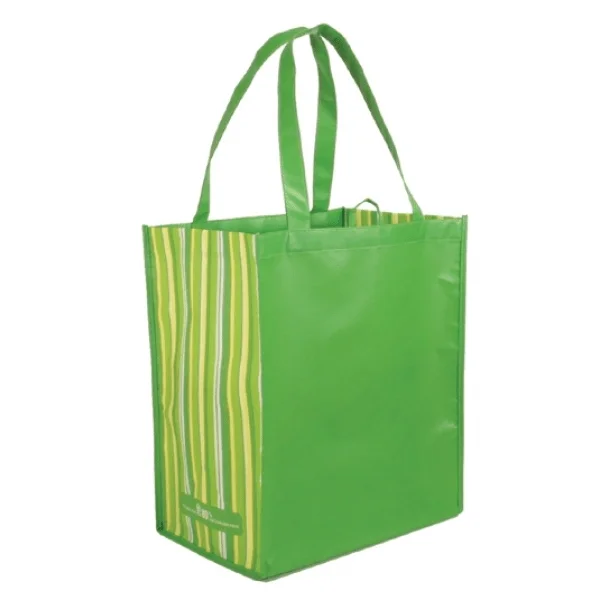 Your customers will rave about this sturdy bag, which is spacious enough to carry your weekly groceries and then some, with no trouble at all. With its mesmerizing colors and eye-grabbing stripes, this bag sends powerful branding and environmental messages by drawing tons of attention wherever it goes. 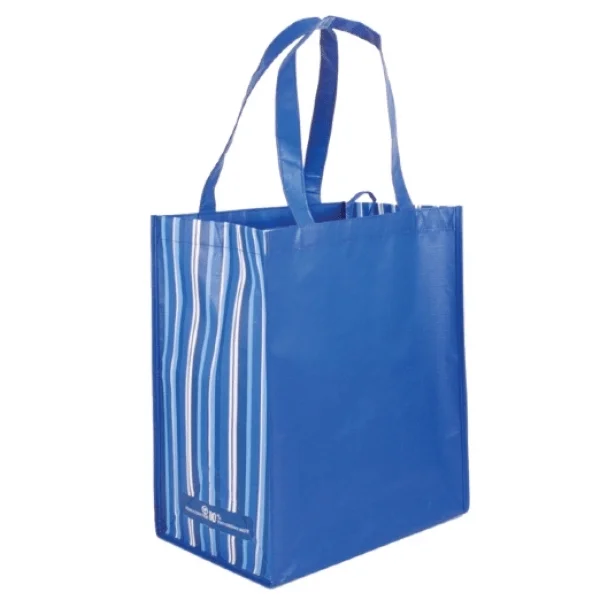 Manufactured with recycled post-consumer PET bottles, this eco-friendly tote bag helps your business stay true to its commitment to environmental protection. You can choose from a variety of stunning colors, including red, green, blue & black. The contrasting side stripes in magenta, yellow, black and cyan are imprinted using full-color printing, so there is no question of the hue fading with handling or with time. 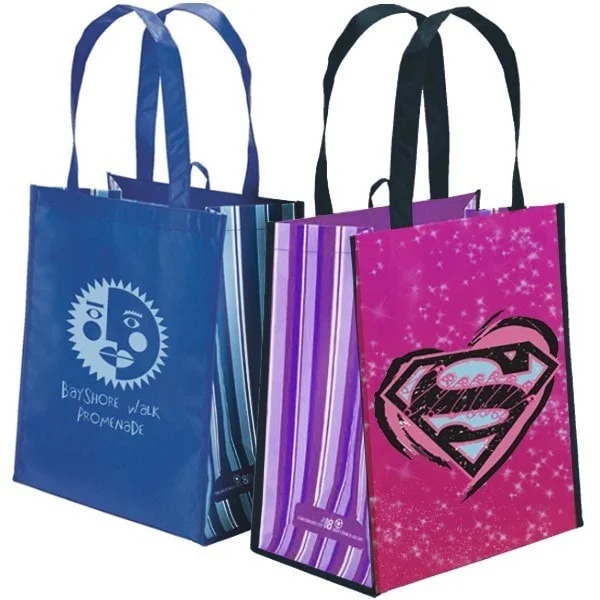 And you can get your Reusable Wholesale Tote Bags printed with your corporate colors, as well as attention-grabbing designs and/or highlight messages presented in various hues on this attractive mobile canvas. The matte laminated outer layer is water repellent, making this recycled grocery bag the ideal companion for the rainy days. And it was crafted using tear-resistant material so your customers can put it to rough use without fear of damaging it. So your company's logo or message is sure to be seen on the bag's exterior for years to come. 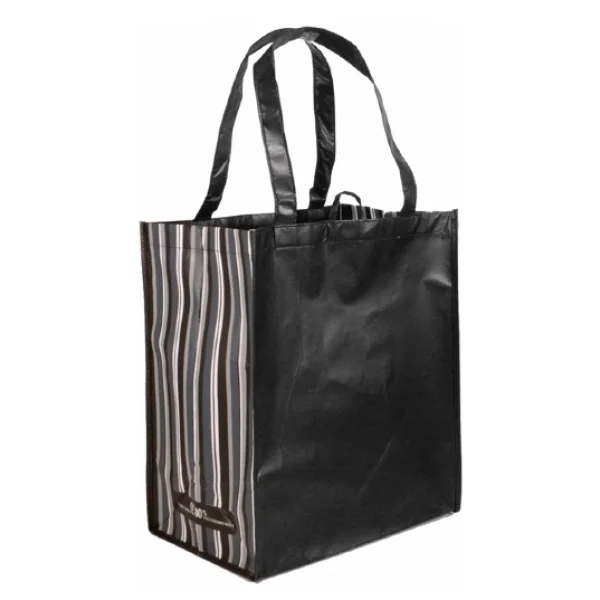 The Reusable Wholesale Tote Bag is an excellent corporate gift that serves to subtly pass along your branding message. When you give this bag away at your next trade show or expo, watch how the crowds flock to your stall to grab their very own stylish side-stripe bag. What better way to draw the crowds to your booth? This bag is easy to fold and stores away in a small compartment in the car or in a handbag. And a hanging loop has been built in to let the user simply put the bag up on a handy hook where its contents are out of the way and your branding message is on display. In addition, this bag complies with California Proposition 65 and is perfectly safe for the environment. Place your order today and receive special pricing on this stunning side-stripe bag right. Our minimum order quantity is 1,000 pieces. If you need colors converted, our talented designers will be happy to do that as well, for a nominal additional charge. Once an order is placed, we are happy to make revisions to your artwork if necessary, and the first hour is free! If color matching is critical, we will send you a proof of the product before we start production, so we meet all your expectations—to the last detail.